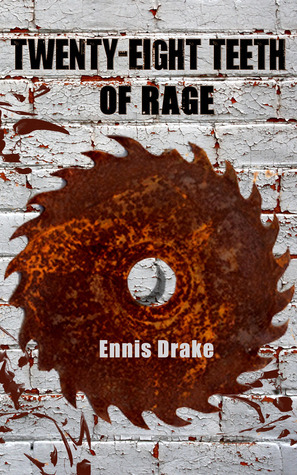 This short debut novel quickly establishes that newcomer Ennis Drake can really write. The narrative voice is strong, rich with nuance and flavor. Scene after scene exhibits Drake’s competence at playing out a narrative thread. The book is clearly in the horror category but also has a noir genre feel to it, including the common noir element of the emotionally or psychologically damaged law enforcement officer for a main character. The whole story, every character interaction, is a pool of hard, bitter emotions. Everybody in the book seems hurt and wanting, stuck in an agonizing pattern of self-defeat and dysfunction. Characters seem realistically flawed, emotionally alive. It’s clear what they want and what’s keeping them from getting it. Drake’s strength as a writer is in clearly rendering these people (particularly Riley, the protagonist) so they seem believable and familiar to the reader. Throughout this book, I felt what the characters felt. The ability to give the reader this experience is arguably the most important determinant of whether a book succeeds or fails. On this test, I say Drake easily passes. The novel is quite strong in terms of execution, of conveying believable characters with a strong narrative voice. An aspect I consider less successful is the central conceit of the possessed or demonic power saw. Much of Stephen King’s very popular oeuvre has been built on similar concepts — such possessed/demonic objects as a hotel, laundry press, lawnmower, classic car, eighteen-wheeler, even a St. Bernard. Despite King’s success with this approach, I’d argue a stronger, more interesting antagonist or threat could be created by not merely applying demonic or malignant qualities to a mundane object. I’d love to see Drake’s skill for storytelling, and the creation of realistic characters, applied to a stronger, more complex basic concept. The only other shortcoming is in those sections of written or recorded testimonies of characters in their own voices, which sound not like a real person telling their story, but more formal, like a novel’s narrator. Through these segments important backstory is revealed, so these passages are necessary, yet the tone is slightly off. This problem does not exist with the novel’s spoken dialog, which is both naturalistic and believable, so it’s clear Drake knows how to convey the way people really speak. This minor quibble applied only to the sections of Jodi’s diary and Strom’s recorded testimony, and really didn’t detract much from my enjoyment of the book. These reservations were certainly outweighed by the confident, fluent prose and believable characterization. Overall, Twenty-Eight Teeth of Rage is a compelling, passionately-told drama, and a successful piece of writing. From the first page I was impressed with Drake’s ability to draw the reader into an intense, vividly emotional scene. Flaws may be present, but not many for a first novel. I’m eager to see how Ennis Drake applies his obvious authorial talents to different story concepts in the future.